Snacks Eaten: Guacamole and chips, breakfast at IHOP, lots of coffee, blackberries, salad, brie and apple chips. Could you list a few high-interest books that you think could keep a Reader engaged for next year? We Have Always Lived in the Castle, A Streetcar Named Desire, and AD: The Deluge. Do you have any suggestions for how to improve the Read-a-thon next year? Honestly no, you guys are awesome. What do you think worked really well in this year’s Read-a-thon? The cheerleaders were so organized! I loved that Heather split them into groups to cheer on specific platforms. How many books did you read? Seven! If you were a Cheerleader, do you have any advice for next year’s Cheerleaders? I cheered for 3 to 5 blogs each hour and that split it up nicely for me. I like that more than taking a big chunk of time just to cheer. How likely are you to participate in the Read-a-thon again? What role would you be likely to take next time? Definitely! I will be both a reader and cheerleader and maybe host a mini challenge or something. 3. What book are you most looking forward to for the second half of the Read-a-thon? I think I might need a comfort re-read to keep going and Hitchhiker's Guide to the Galaxy would be perfect. 4. Did you have to make any special arrangements to free up your whole day? I made sure to avoid scheduling anything today and the Huz is keeping me company. 5. Have you had many interruptions? How did you deal with those? A few, I tried not to get to worried about missing reading time. 6. What surprises you most about the Read-a-thon, so far? I haven't taken a nap yet! This is the first readathon with no nap for me! 7. Do you have any suggestions for how to improve the Read-a-thon next year? I know you guys say it every year, but stressing that people should turn off word verification on comments is always great for cheerleaders. 8. What would you do differently, as a Reader or a Cheerleader, if you were to do this again next year? I have figured out quite a few things that work for me. I would probably take allergy medicine earlier in the day next spring because my sinuses are going nuts. 9. Are you getting tired yet? Surprisingly, no! 10. Do you have any tips for other Readers or Cheerleaders, something you think is working well for you that others may not have discovered? For me I really like cheering for about 5 blogs per hour. That way my comments stay fresh and it gives me a short reading break. Books, snacks, naps, it's Dewey day!!! hosted by Lisa's World of Books. Best Supporting Character: Almondine from The Story of Edgar Sawtelle by David Wroblewski. One of the best characters I've encountered... and she's a dog! Best Fantasy Book: Tooth and Clawby Jo Walton, it's a re-telling of a Trollope novel with dragons. Best Non-Fiction Book: At Home by Bill Bryson, he could make any topic interesting. 4) Tell us a little something about yourself! I'm turning 30 in May and I'm so excited about it! I'm taking a trip to New Zealand, Australia and Fiji in September and I've read 27 of Shakespeare's 37 plays. 5) If you participated in the last read-a-thon, what’s one thing you’ll do different today? This is my 7th readathon (I've linked to the others at the bottom of the post). Last time I was in Iowa visiting family. This time my whole day is about reading! It’s Readathon time! 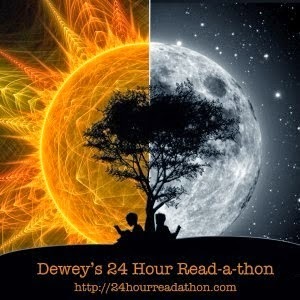 For the past few years I’ve spent one day each April and October participating in the Dewey Readathon. It’s always so much fun and I get a ton of reading done. There’s a great sense of community, mini-challenges each hour, cheerleaders and prizes. Heather and Andi are the incredible ladies who help organize the whole thing and you can get more details at the official site. Tomorrow I will be reading from 8 am until whenever I fall asleep! 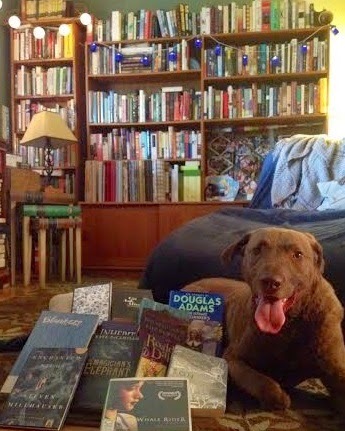 I have my stack of books ready to go (see my pile with Ollie pup above) and I will be cheering for at least 4 hours. - Have meals for your day ready to go. I’ve got chili already made for dinner. It gives you more time to read. - Listen to an audiobook during events that can’t be avoided. If you have to do a bit of yard work or cooking, have an audiobook on while you work. - Have snacks ready to go. I look forward to special snacks on readathon day, but don’t pick only stuff that’s bad for you or you’ll sugar crash pretty quickly! Good informational post! Good idea about the whole not-a-whole lot of sugary snacks so as not to crash sooner than planned. Can't wait to see how your day goes on sat! And I see The Magician's Elephant there, which I haven't read, but have heard how fast-paced it is! Good Luck. I will be cheering you on! Good luck! I'll be following your progress! I did the readathon for the first time last October and had a blast. Can't do it this weekend due to family obligations :-( Curses. Ollie looks ready to go too! Oh, I love doing this! But it is really hard for me to carve a whole day out of a weekend, when my kids are going 10 different directions, my husband has his own agenda, and I'm obsessing over so many TV shows. The best I've been able to do for the last couple of years is just read MORE than I usually do. Ha! And I love your reading partner! What fun! Hope you have a great time and get lots of reading done. I'll be doing my own little readathon tomorrow for a few hours, but will be cheering y'all on in spirit! #HappyDance! I can't wait! I can't wait! So glad you're with us, Melissa! Good luck! I will be cheering you on too. What are you reading first? Whoot whoot! I am ready to read! Have a wonderful time, Melissa! Looks like you are on track so far. That might have to do with the fact that you are a veteran!Keep going and keep reading! Yay for readathons! And oh my you are rocking with your commenting AND reading! I keep spending time commenting and cheering and am not getting much reading accomplished. But it's lots of fun. Happy Readathon Day! Yay for Tooth & Claw! By far my favorite new-to-me book this year - thanks to you! You are on a roll! I haven't read The Witch of Blackbird Pond in years. Is that The Hitchhiker's Guide to the Galaxy?! What a great book. I'm here to cheer and you're doing great! Cool trip in September. I went to New Zealand by way of Fiji almost 30 years ago and it was a beautiful journey! I read The Witch at Blackbird Pond during one of the readathons last year! It was one of my fave books of the year - hope you loved it too! I love the picture of your pup for hour ten - that's pretty perfect! Looks like your moving right along! I love The Witch at Blackbird Pond! Excellent choice for today! You are making excellent excellent use of your time! I'm not sure I'd do as well if I was participating. What do you think of Blankets? I finally read that last year. Keep up the good work, Melissa! You are doing great so far. Wonder Woman! You've really got a groove going on -and I plan on using alllll your planning tips in the next read-a-thon! O Avid One! Even though circumstances prevented me from being in this Readathon, I had to come by and see how you're doing. Great books and even better updates. Love your photos! Melissa, you are doing awesome. I am so impressed with endurance readers like you. I know I'd be asleep by now. I figured out the trick for the robot verification. If you click on the little refresh to get a different captca, it's all numbers and is much easier to read. Thank you to everyone for your comments and cheers! They definitely kept me going! What an incredible readathon! I was busy all weekend so wasn't able to stop by, but wanted to say congrats on the great job Melissa. I'm back to read your end-of-event meme. It sounds like you had a great read-a-thon! The Witch of Blackbird Pond was a favorite of mine when I was younger -- it would be a great book for me to re-read. Great post, Melissa, and you are so right about being organized! That's my main goal for the next readathon. My favorite thing, though? That you have IHOP in your list of snacks. LOVE IHOP! But it would make me fall right asleep. Lastly, great reading list and I'm sure I'll see you around the TBR Challenge!